Fifteen year old Isaac Allen is a sophomore and honor roll student of Boulder High School. He is taking college courses at CU Boulder through Boulder Valley School District’s concurrent enrollment program, and has recently received recognition from the National Society of Collegiate Scholars. Isaac plays piano and violin, actively performing in solo, duet, quartet, chamber and orchestra. Isaac is also a karate black-belt, and a baseball starting pitcher. Isaac started music training when he was eight years old. Professor James Maurer is his violin teacher and mentor. Pianist Keiko Haneda has been working with Isaac collaboratively for 5 years. Isaac has twice received full scholarship from the Heifetz International Summer Institute. This summer, Isaac was accepted by the Aspen International Summer Music Festival & School for the full session. Isaac won his first concerto competition and made his solo debut at age 10. Since then, Isaac has been awarded many local, state and national titles, and he frequently performs with orchestras in Boulder, Denver, Longmont, Broomfield, and Aurora. Isaac has performed in master classes for Nicholas Kitchen, James Buswell, Grigory Kalinovsky, Patinka Kopec, Pamela Frank, Shmuel Ashkenasi, Charles Wetherbee and Kenji Bunch. However, the performing opportunities that he has enjoyed the most have been concerts given in small communities to promote humanity and classical music — including Longmont United Hospital, Tennyson Center for Children, Boulder Public Library, HCR ManorCare, Balford Senior Living, First Congregational Church, DYAO painted violin, Longmont’s Concert for 5th graders, and Colorado Public Radio’s Instrument Drive. Isaac joined Denver Young Artists Orchestra and received its “Best New Member Award” in 2009. He is now the Concert Master of Boulder High Orchestra III, and also plays in the Western States Honor Orchestra and the All State Honor Orchestra. Starting in 2008, Isaac attended the CSU Pre-College Quartet Program for 2 years. Later, Isaac formed his own quartet group, which still continues. His quartet group won the “Best Narrative Quality Award” in the 2009 Ft. Collins Festival. Isaac is now a member of CU Quartet, and has twice received the honor to participate in two-day master classes given by the Boston Borromeo Quartet. A thumb injury during sparring in Karate tournament this summer kept Isaac away from piano and violin for 3 months, hence Isaac took a creative route with his musical energy. He wrote piano miniatures, sonata for violin, as well as music for quartet, quintet, and orchestra. Isaac’s orchestral piece was played by the BHS Orchestra. In March, Isaac’s first string quintet composition was awarded Honorable Mention by the ASCAP Foundation’s National Morton Gould Young Composer Competition. Once his thumb was healed in September, Isaac gradually went back to his violin practice. 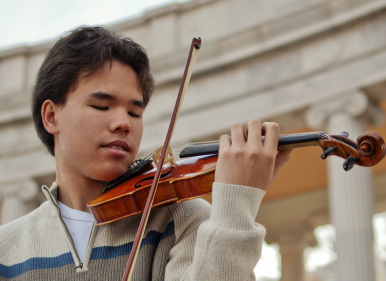 He participated the Denver Young Artists Concerto Competition in November and was awarded first place. Isaac will be the featured soloist to perform in the Boettcher Concert Hall of the Denver Performing Arts Center for the Denver Young Artists’ 35th anniversary season finale.